So basically now we get to have two different categories of things to look forward to - stuff we’re excited about for us and stuff we’re excited about for the kids. But sometimes these two categories gloriously overlap. Sometimes I catch a glimpse of something that looks amazing and I’m positive it will blow my kids minds as well. It doesn’t get much better than that - because then you get to be doubly excited. So, to sum up, you should have lots of kids. It’s basic math. Quite recently I had one of these doubly-excited experiences. I saw a picture of a board game with a spooky forest on the cover. The moonlight shone through the trees and cast shadows across the forest. If that wasn’t enough to pique my interest, that’s when I saw the tagline - “Play In The Dark Strategy Game”. A board game that you have to play in the dark? Holy smokes. Hold me. As you can tell I am not immune to the appeal of novel concepts. Neither are my children, or most children for that matter. I feel like the power of the child’s imagination thrives on good, creative ideas. I knew intuitively that my son’s face would light up when he heard there was a board game you had to play in the dark. I knew the wheels in his head would start to turn thinking of the possibilities. I also happen to be a big fan of spooky things. So when I saw it, I knew immediately that I had to have Shadows in the Forest to play with my kids. Shadows in the Forest is published by Thinkfun, and it’s actually a re-release of Waldschattenspiel - a German game originally made by Walter Kraul in 1986. In the original version the game board is illuminated by a single small candle. In this new version, the candle is replaced by a cute, little LED lantern. You lose the flickering shadow effect of a campfire in the middle of the woods, but I imagine that requiring small children to play with fire is not an easy sell for toy companies these days. I know what you’re thinking. A creepy forest game that you have to play in the dark - how could it possibly get any better? Oh it gets better, because I haven’t told you about the Shadowlings yet. The Shadowlings are hiding in the dark forest, and trying to avoid the light as the lantern moves about the board. And these Shadowlings are adorable. They look like cute, little Totoros. And they have cute, little white masks that they wear. And their cute, little masks come off. I mean, you might as well stop reading now, because I don’t know what more you could want. Gameplay works as follows: One player, the Seeker, is in control of the lantern and everybody else cooperatively controls the Shadowlings. The Seeker rolls the glow-in-the-dark die and moves the lantern around the forest trying to shine its light on a Shadowling. If a Shadowling is exposed, it is frozen and you remove its little mask. Then the Seeker closes his or her eyes and the Shadowlings can move about the forest. They must stay on the game board and they must stay in the shadows (you have to be honest here). Like freeze tag they can unfreeze their friends at this time and put their masks back on, but only if they all remain in the shadows. If all of the Shadowlings can make it to the same tree or boulder, they win. If all of the Shadowlings are frozen, the Seeker wins. When we first played we put every single one of the various trees and boulders on the board. I hid my Shadowlings and my son controlled the lantern. After he rolled the die and moved the lantern, it seemed to me like I could win very quickly. There were just too many hiding places and too many shadows to walk around in. That’s when I realized the importance of modifying this game to find the sweet spot for you. You have complete control over how many hiding places you put on the board to start the game, and you can make the game much harder on yourself by taking some of them out. Another family modification I thought of happened as I was playing with my son and I was the Seeker with the lantern. I personally think it’s more fun to be the Shadowlings and try to creep around the shadows (my son and I both like to say “scamper, scamper, scamper” while we’re moving them from tree to tree). The Seeker’s job is to roll the die and move the lantern and close their eyes. It’s exciting to catch a Shadowling in the light, but for the most part all the Seeker does is choose to turn the lantern left or right at forks in the road. Since it was just us two, I realized I wanted to feel more like we were playing together, so we added another die roll to the game to control the lantern. You can call odd numbers “turn left” and even numbers “turn right”. When you land on certain squares you’re allowed to choose if you want to turn around, and you could roll for that as well - odds “go forward” and evens “turn around”. With that the lantern movement is both on auto-pilot and randomized. This way everyone playing can be on team Shadowlings, if you’d like. 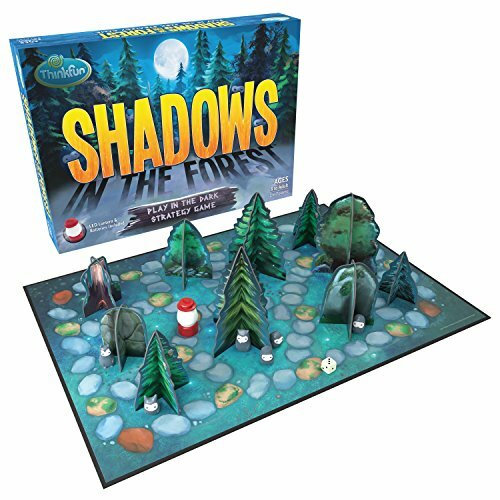 Shadows in the Forest is a fantastic, creative game to spice up a family game night. 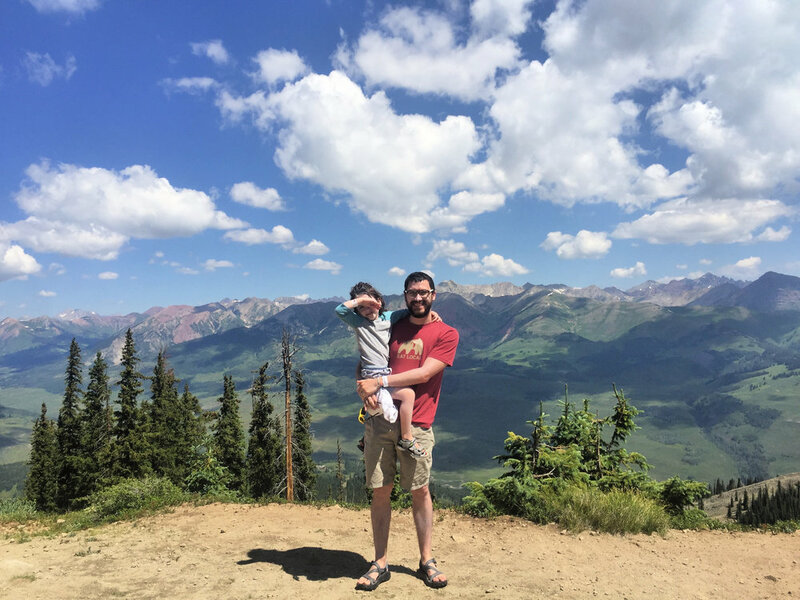 I can’t wait to bring it along on our next family camping trip, because playing at night in the woods near a campfire strikes me as the very best possible scenario. Requiring you to play in the dark gives this game the perfect, spooky atmosphere for this time of year. If you’re looking for a board game to help set the Halloween mood, look no further. Have you tried Shadows in the Forest yet? Are you Team Shadowlings, or Team Seeker? Does your family have any other spooky board games you like to play? Let us know in the comments!